Chattanooga&apos;s first turnaround was its riverfront – a $120 million project completed in 2005 that paved the way for popular events like the Ironman Triathlon and the RiverRocks festival. A technology evolution came next in 2010 when Chattanooga&apos;s electric power board premiered the fastest Internet service in the country. Now homegrown startups like Bellhops and tech transplants like Carbon Five find themselves at home in Chattanooga. While Chattanooga continues to move toward big-city amenities like expanded downtown living and the newfound Chattanooga Film Festival, the city&apos;s small-town spirit – fostered by farmers markets, tight-knit networks and owner-operated small businesses – is alive and well. Chattanoogans are proud of their city. Plenty of business names start with"Chatta," end in "Nooga" or reference the "Scenic City," Chattanooga&apos;s nickname. 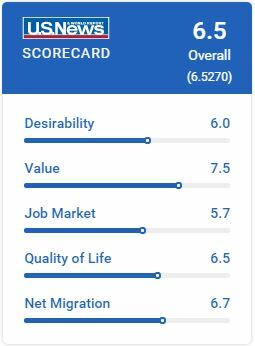 U.S. News analyzed 100 cities in the United States to find the best places to live based on quality of life and the job market in each city, as well as the value of living there and people&apos;s desire to live there. Chattanooga ranks as #55 with an overall score of 6.5 out of 10. What&apos;s the cost of living in Chattanooga? 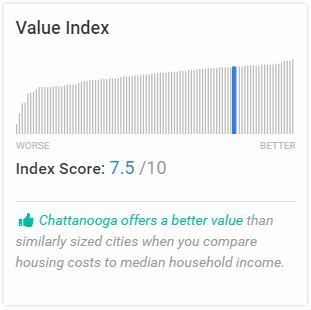 The average cost of living in Chattanooga is below the national average, but that keeps pace with its median wages, which are also lower than the national median. A good portion of residents&apos; paychecks is dedicated to housing. Chattanooga has some of the fastest-rising rents in the country; rates increased nearly 30 percent over the past five years. Generally, a better bet in Chattanooga is to buy a home. Home prices in Chattanooga have also been on the upswing since the recession, but the median home price remains noticeably lower than the national average. What&apos;s the weather like in Chattanooga? Chattanoogans experience all four seasons. 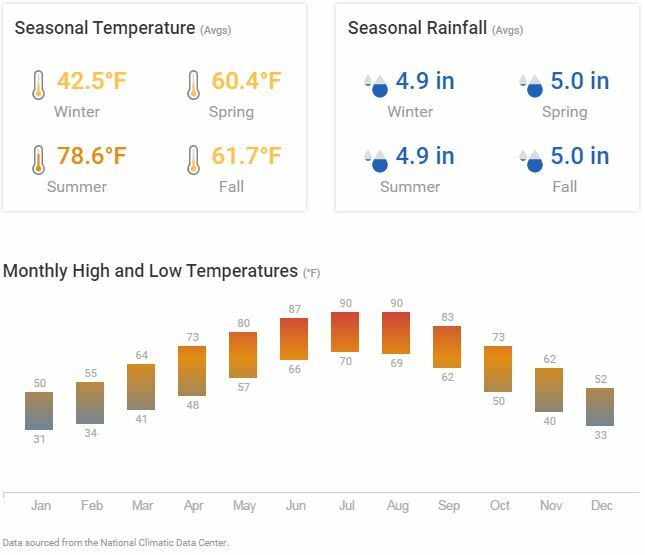 The area&apos;s moderate climate makes for mild winters with average temperatures in the 50s and rarely any snow. Chattanooga&apos;s steamy summers are characterized by high humidity and temperatures in the 90s. Spring brings highs in the 60s and 70s. The city&apos;s location between Missionary Ridge and the Lookout and Signal Mountains allows Chattanoogans to enjoy a breathtaking view of changing leaves every fall. What&apos;s the best way to get around Chattanooga? 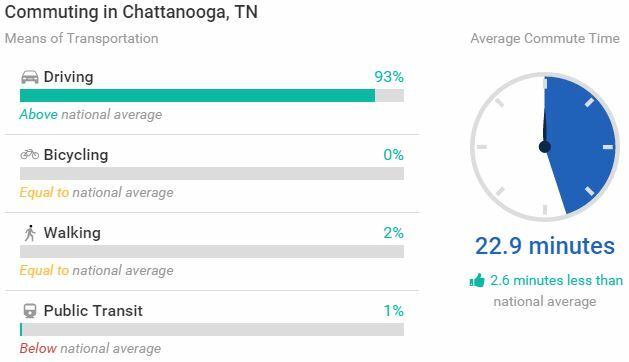 Most Chattanoogans rely on their cars because it&apos;s the most convenient and expedient way to get around. Still, there are some public transportation options, including the Chattanooga Area Regional Transportation Authority (CARTA) buses and downtown shuttle, though these offer limited routes and restrictive service hours. Cycling is also an option thanks to the city&apos;s bike-share program and its expansion of protected bike lanes. The small Chattanooga Metropolitan Airport is just 15 minutes beyond its downtown and features nonstop service to destinations like Atlanta, the District of Columbia and Orlando. However, larger airports in Atlanta and Nashville are each just a two-hour drive away. Amtrak doesn&apos;t service Chattanooga, but ground transportation is provided by several charter bus companies, including Greyhound. Chattanooga is one of the fastest-growing cities in Tennessee. Its population is fairly young with almost 50 percent of the residents under the age of 34. 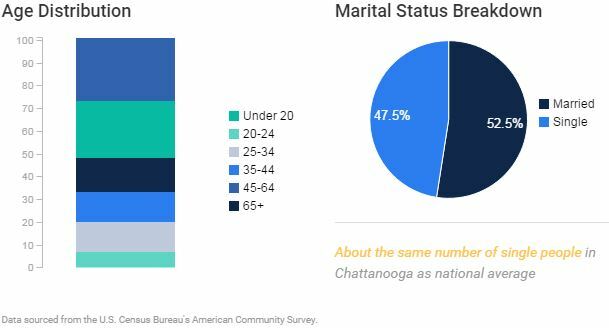 Predictably, the majority of Chattanoogans – nearly 60 percent – live in family households. Chattanooga&apos;s Northshore and surrounding suburbs are especially popular for families, as are the more affluent Lookout Mountain and Signal Mountain communities. Chattanooga sits along the South&apos;s Bible Belt, and about 60 percent of Chattanoogans say they affiliate with a religion, with Evangelical Protestantism being the most popular sect. Tennessee is a primarily red state, but close to 40 percent of Chattanooga&apos;s population sides with the Democratic Party. Nicknamed "the Scenic City," Chattanooga is known for its beautiful natural surroundings. Outdoorsy residents find no shortage of world-class climbing, hiking loops, kayak routes and mountain biking trails. The 10-mile Chattanooga Riverwalk, which winds along the Tennessee River through the city&apos;s downtown, is a mild excursion. Chattanooga&apos;s Coolidge and Renaissance parks – a combined 36 acres of public land, walkways and sculptural art– also sit along the Tennessee River. Meanwhile, Chattanooga&apos;s love for all things local means there are plenty of small boutiques, specialty coffee shops, galleries and restaurants to frequent. Frazier Avenue and Warehouse Row are other prime shopping spots. Other downtown destinations include Chattanooga&apos;s landmark aquarium, the Hunter Museum of American Art, the historic Tivoli Theatre and the iconic Walnut Street walking bridge.